Rich, luxurious DIY body butter that’s super easy to make and will soothe even the worst dry skin! 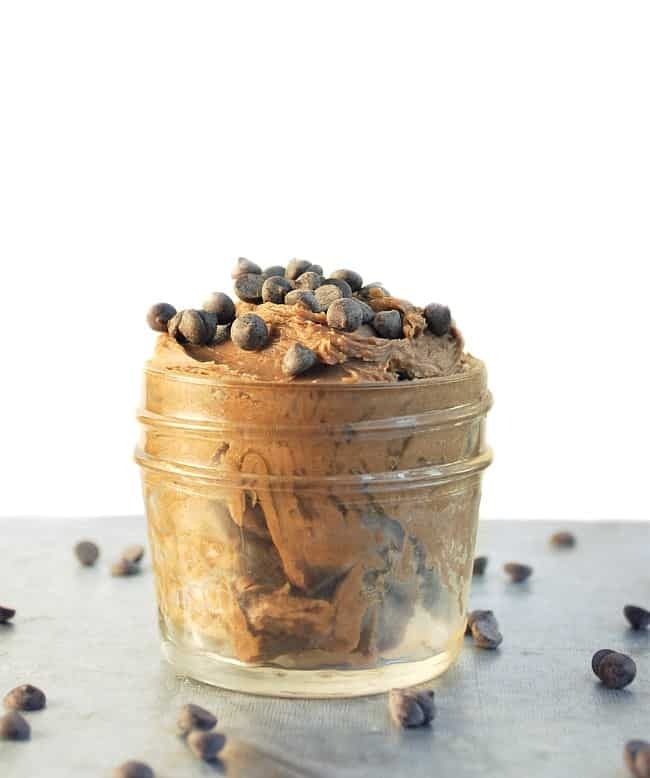 This double chocolate version is made with cocoa butter, almond oil, and other all natural ingredients. I don’t know about you but, the colder and drier the winter air gets, the more fanatic I get about hand lotion, body butter, and lip balm. I already have a go-to lotion recipe, but this luxurious body butter is a thicker, even more moisturizing alternative that leaves your hands amazingly soft and smooth! And it looks and smells good enough to eat! Then just melt, chill, and whip! The cooled mixture has a firm texture – If you want a lighter, fluffier body butter, use an electric mixer to whip the chilled mixture to soft peaks. For Chocolate Mint Body Butter, add 8 drops of peppermint essential oil. Regular and mint flavors both make great lip balm too! Don’t omit the beeswax! Adding the small amount of beeswax provides just enough drying to give a nice, moisturizing texture without leaving any oily residue. Rich, luxurious DIY body butter that's super easy to make and will soothe even the worst dry skin! Made with cocoa butter, almond oil, and other all natural ingredients. Melt cocoa butter, coconut oil, and beeswax in a small saucepan on the stove or in a glass bowl in the microwave. Whisk occasionally during heating. Allow mixture to cool in the fridge (will take a few hours), then whip by hand with a wire whisk (which is what I did) or in a stand mixer (which will yield a lighter and fluffier texture). Transfer to storage containers (makes approximately 16 oz). To use, dab a tiny amount (half a dime) on finger and massage into both hands. The cooled mixture has a firm texture - If you want a lighter, fluffier body butter, use an electric mixer to whip the chilled mixture to soft peaks. Don't omit the beeswax! Adding the small amount of beeswax provides just enough drying to give a nice, moisturizing texture without leaving any oily residue. If you’re new to homemade skin products, you may have a few questions. Here are some answers, but please leave a comment below the post if you have other questions! Q: Does this leave a brown color on the skin? Q: Are there other uses for it? A: Yes – it makes a great lip balm! Q: Can you add other scents? A: Yes! A few drops of essential oil can be added before chilling. I added 8 drops peppermint oil and loved the chocolate mint smell! Q: Do you have tips for cleaning the dishes after making this? First, use paper towels to wipe pans, bowls, utensils and mixer blades (ingredients aren’t water soluble, so they won’t rinse off well with water alone). If possible, reheating them just enough to liquefy any remaining ingredients makes it really easy to carefully wipe them down with a paper towel. Next, use your hands to rub liquid soap onto the surface of the bowls, utensils, etc., helping release any residue from the ingredients. Last, thoroughly rinse with warm water. You’ll Also Love This White Chocolate Body Butter! you have shea butter in directions, but not in ingredient list. Is shea butter in this recipe? I’m sorry about the confusion, Carol! There were several renditions of this recipe and the cocoa butter and coconut oil version won out. So no shea butter in this one. I’ve updated the ingredient list to reflect that – thanks so much for pointing it out! Yay! I love this one too! What’s the shelf life like on this one? At least six months (about how long it takes me to use it up), but I would guess it would keep much longer than that if needed! Thank you! I’m planning to gift this to someone but they only really need it for their hands and I didn’t want it to spoil prematurely. Do you have a cocoa butter preference? You don’t seem to have that linked up in the ingredient list. The others are. 🙂 Edit to add: The Raw Cacao link doesn’t work anymore! Thanks for pointing out the broken link for the cocoa butter, Valerie! I’ve just corrected it in the list of supplies within the post. You should be able to click over to Amazon and buy some now. 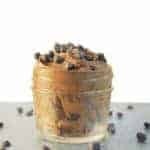 Will the formula work if you don’t add cacao powder? I don’t want the chocolate color . I made this but after the cooling process, it’s a solid and unable to be “whipped”. Did I do something wrong? Even if it’s firm, you should be able to whip it. If it’s too hard, you could heat to soften it, add a little extra coconut or almond oil, then try chilling and whipping.